Today, here are two quick mini-reviews for the afternoon. 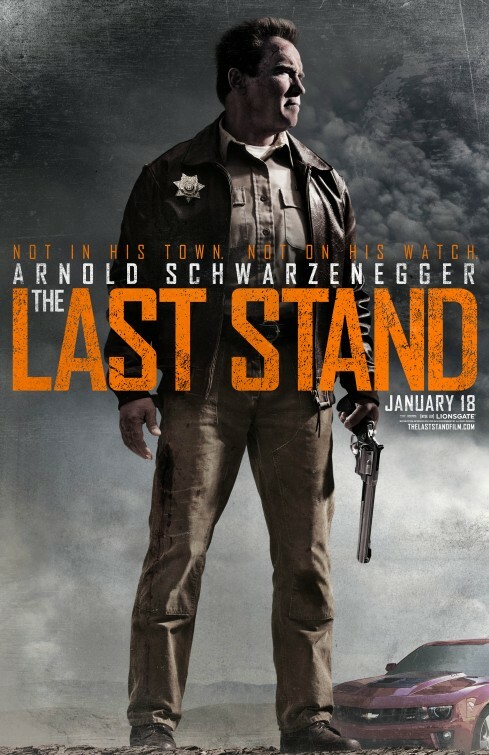 One is of Schwarzenegger’s return in The Last Stand (he told you he’d be “bahk”!) 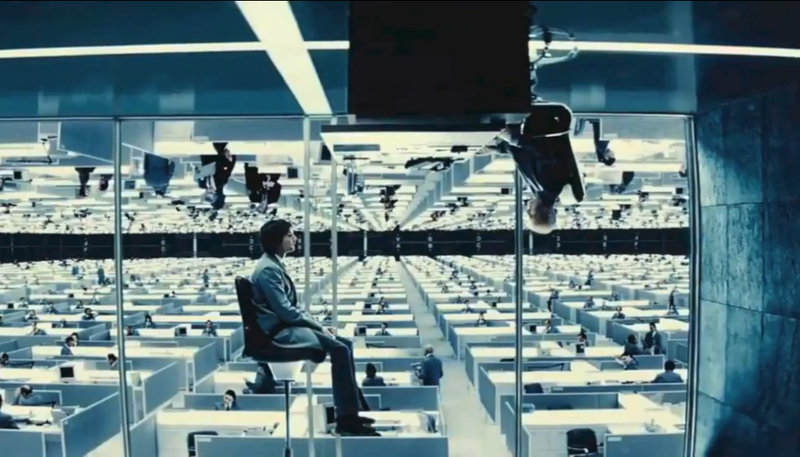 and one is of the lesser known but better movies of 2012: Upside Down. Synopsis: After leaving his LAPD narcotics post following a bungled operation that left him wracked with remorse and regret, Sheriff Ray Owens (Schwarzenegger) moved out of Los Angeles and settled into a life fighting what little crime takes place in sleepy border town Sommerton Junction. But that peaceful existence is shattered when Gabriel Cortez (Eduardo Noriega), the most notorious, wanted drug kingpin in the western hemisphere, makes a deadly yet spectacular escape from an FBI prisoner convoy. 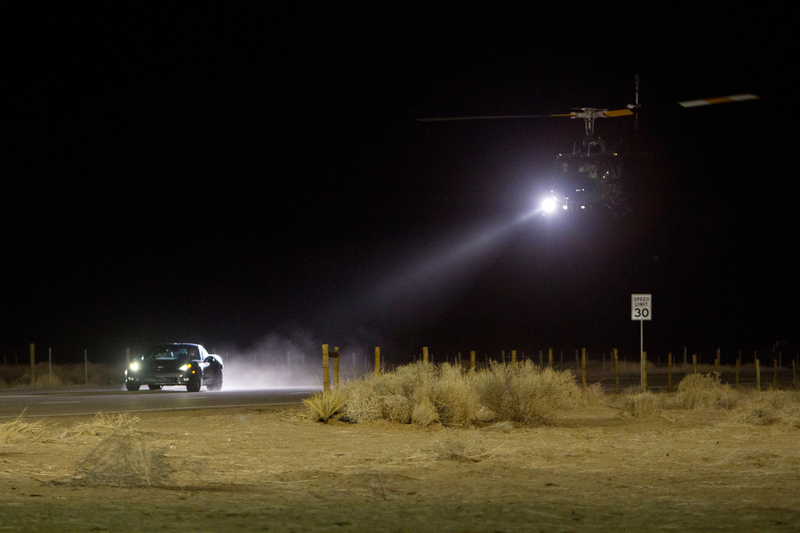 With the help of a fierce band of lawless mercenaries led by the icy Burrell (Peter Stormare), Cortez begins racing towards the US-Mexico border at 250 mph in a specially-outfitted Corvette ZR1 with a hostage in tow. Cortez’ path: straight through Summerton Junction, where the whole of the U.S. law enforcement, including Agent John Bannister (Forest Whitaker) will have their final opportunity to intercept him before the violent fugitive slips across the border forever. At first reluctant to become involved, and then counted out because of the perceived ineptitude of his small town force, Owens ultimately rallies his team and takes the matter into his own hands, setting the stage for a classic showdown. Review: Man, I sure would love to have a car that can not only go 200+ miles per hour, but also do it for hours on end without running out of gas! Ha! That, among several other ridiculous fight physics, plot lines, sequences of events, frivolous characters and some silly dialogue, just about sums up some of the cheesiness of Schwarzenegger’s The Last Stand (not to be confused with the last stand of General Armstrong Custer). The incapacity and uselessness of the FBI in this film is laughable at best along with useless storylines and moments that do nothing but make you shake your head. That being said (getting a few expectations laid as you should probably disconnect the “rational thought” cord from your brain before watching this.) the film is truthfully not all that bad as a comedy. It is listed as a thriller, but I tend to label it as a good comedy mixed with plenty of action and violence. The film doesn’t take itself seriously and neither should the audience (trust me, you will enjoy it far better if you don’t). Schwarzenegger carries this film as he pokes a bit of fun at himself with statements about being old, allowing himself to take a little bit of a beating from a guy who, in real life wouldn’t stand a chance against the Governator, etc. The added cast, specifically Johnny Knoxville and Luis Guzmán, bring in the extra enjoyment as their simple comedy brings several laughs amid the gunfire and Gatling guns. Two particular castmembers seemed completely ineffective and unnecessary: Forest Whitaker (unfortunately) as the head FBI agent who does practically nothing in the movie, and Eduardo Noriega as the escaped fugitive who is one of the dullest villains so far in this year’s cinematic offerings. Starring: Kirsten Dunst, Jim Sturgess and more. Review: What a fantastic delight! After watching this trailer earlier last year I could not wait to see it. A “Romeo and Juliet” story of forbidden love in which two worlds separate the two lovers. Follow the fight for love as they go through unimaginable odds to overcome. Juan Diego Solanas skillfully sells the idea of two worlds so close to one another and establishes the rules of physics early on that make way for some highly entertaining fun. This French-Canadian film is such a joy and I encourage you to seek it out. While the conclusion felt a little rushed, Upside Down ends in a manner that satisfies. I really do it little justice in my review here, but that is partly in fact because I want to reserve some elements for you to enjoy on your own. Trust me, you will not regret watching this film…if you can find it. 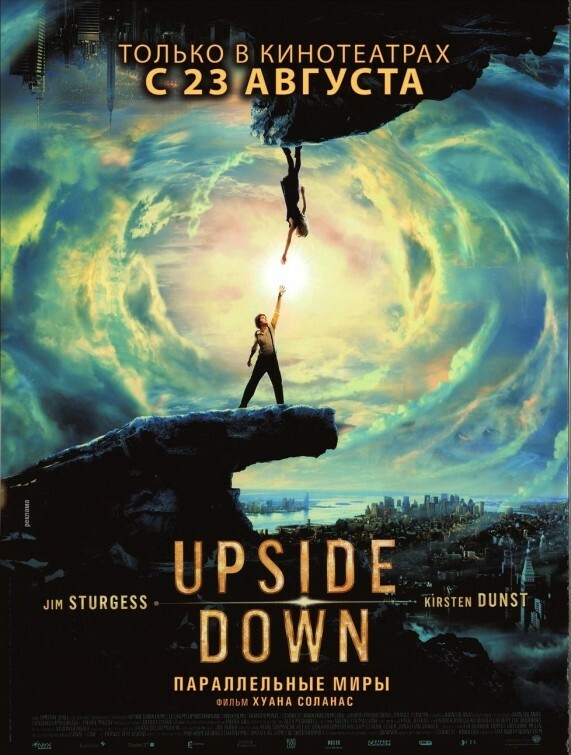 I’m looking forward to “Upside Down”. Your the first person I have read that has reviewed, and I’m happy you liked it so much. I’m keeping my eyes peeled for it in Miami. I really did like it as much as my score indicates. Sure, it has its parts, but it is just so beautiful and the story/characters made it special. Hope you get to see it soon. acting was stiff for you? I just didn’t see it that way. Interesting. I saw them as being not so well-rounded characters which is what I expected from people in close-minded societies such as theirs. that’s just how I saw it. Sturgess did well for me too. an intriguing premise and beautifully told. Thanks so much for sharing. I will look for your review! I’m glad that ultimately you still liked it. Time for The Last Stand! I think you will have fun watching good ol’ Arnold! Do check out Upside Down sometime. The Last Stand was fun. I saw you liked it just a bit more than I. Fun to see Schwarzenegger back! Ooh, you will really love Upside Down I believe. that’s a good way to think about The Last Stand…you kinda got to check your brain at the door. it’s “bubblegum for the brain” as one of my friends said. Yup, our views on “The Last Stand” are almost identical. LOTS of things that you have to shut off your brain over, but enjoyable enough if you’re willing to do that. 3/5 seems right about right. I haven’t heard of Upside Down, but I want to track it down now. As for The Last Stand, I think you’re pretty on target. I will say, though, that I don’t think Noriega was a detractor at all. The movie is never about who his character is or how bad/insane he is. It’s all about the situation and Arnold. oh man, I hope you get to see Upside Down sooner rather than later. so good. The situation is all about Arnold. You got it! but I wanted more from everyone else around him. but at least Arnold was great! what we wanted! Nice reviews, looking forward to seeing The Last Stand. As for Upside Down you know my thoughts about it. You know which shot I love most in that movie? The one where he jumps into the ocean….breath taking! Judging from the trailer, Upside Down could either be a disaster or a total success. The visuals are some of the weirdest and more original ones I’ve seen lately. I do, however, feel as if the film might end up imploding due to the many leaps of faith it asks the audience to take. Since you seem to have liked it my next question is, how and where do I watch it? I’m kind of excited to also see Arnold back in the big screen as he’s one of biggest guilty pleasures. I will most likely wait for The Last Stand to come out in Blu-Ray though. I sent you an email in regards to when/where Upside Down may soon be playing. Did you get it? You’re right, Upside Down looks pretty amazing. One thing I thought was funny was my wife asked why Kirsten Dunst was in this movie, my response was “well, she’s used to kissing guys upside down”.